To shown in the figure the output optic power versus forwarding input current characteristics is plotted in the figure for a typical laser diode. 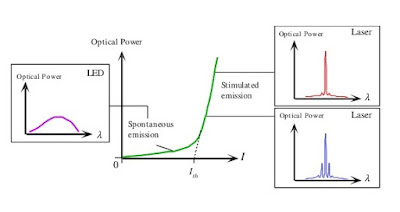 To shown in the figure below the threshold current only spontaneous emission is emitted hence there is a small increase in optic power with drive current. At threshold when lasing conditions are satisfied. At that time when the optical power increases sharply after the lasing threshold because of stimulated emission. Where β is constant for device structure.